Google’s ever changing messaging strategy is changing once more. Today at the Cloud Next event in San Francisco, the company is splitting Hangouts into two: Hangouts Meet — the video conferencing product that we reported on a few days ago — and Hangouts Chat, a new business focused communications tool that aims to take on the likes of Slack, Hipchat and others. The current Hangouts app isn’t going away just yet but Google is essentially putting it on notice. In its place, Google wants consumers to switch to its Duo video-calling app and Allo messaging app. Hangouts Chat will still offer direct one-on-one chats, and it will also still work natively on the web, Android, and iOS. But the focus is now on team communication through group chat rooms. Users will be able to join different rooms based on topics, there’s auto-completed @[username] mentions, integrations with Google and third-party apps, and threaded conversations. Apart from native integrations, Hangouts Chat also supports lightweight scripting with the Google Apps script, as well as bots from the likes of Asana, Box, Zendesk, and more. Google itself created a @meet bot for its upcoming service that can reportedly look at the schedules of anybody in a group chat and automatically suggest a meeting time, then schedule it directly in Google Calendar. 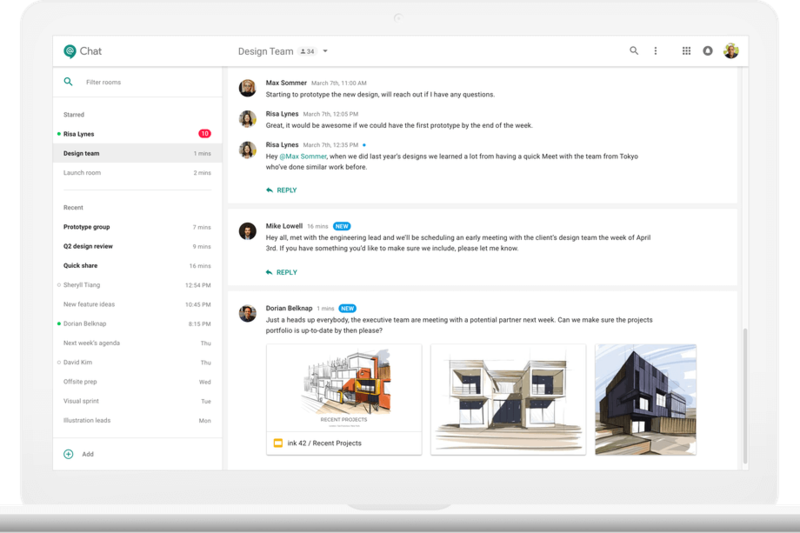 Hangouts Meet is available now to all G Suite customers, while Chat will initially be made available through G Suite's Early Adopter Program sometime in the coming weeks or months.